Doubleday & Company, New York, 1983 First Edition, First Printing with the words "FIRST EDITION" printed on the copyright page. A magnificent copy seldom seen in this amazing shape. This copy is SIGNED by Stephen King on a laid in signature. This ORIGINAL First Issue dustjacket is rich in color with NO chips or tears. The book is in fabulous condition and appears UNREAD. The binding is tight with NO cocking or leaning. The boards are crisp and the pages are exceptionally clean. There is NO writing, marks or bookplates in the book. Overall, a stunning copy SIGNED by the author in collector's condition.. Signed by Author(s). 1st Edition. Hardcover. As New/As New. Garden City: Doubleday & Company. 1983. First Edition; First Printing. Hardcover. 0385182449 . Book condition is Very Good; with a Very Good dust jacket. Minor edge wear to jacket, including a short tear to jacket crown at front panel. Three small ink markings to corner of front end page. Boards slightly bowed. Text is clean and unmarked. 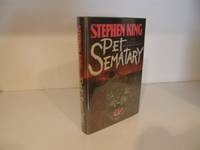 First Edition is stated and correct gutter code on page 374. ; Signed and inscribed by the author, Stephen King, on the half title page. ; 8vo 9" - 10" tall; 384 pages . Garden City, NY ( New York ): Garden City, N.Y.: Doubleday, 1983, 1st Edition, First Printing ( Uncorrected Galley Proof ) , 1983. ----------trade paperback, a Near Fine copy with a wee bit of very light rubbing, this is the 1st state proof which Doubleday issued as a facsimile of STEPHEN KING's actual typescript, about 30 to 50 copies were produced but Doubleday ultimately decided that the quality was not acceptable so another version was issued using typeset, 536 pages, , any image directly beside this listing is the actual book and not a generic photo. First Edition. Soft Cover. Near Fine (see description). Illus. by Linda Fennimore Cover Art . 1983-03-05. New. Ships with Tracking Number! INTERNATIONAL WORLDWIDE Shipping available. Buy with confidence, excellent customer service! G K Hall & Co, 1984-08. Paperback. Good. New York, New York, U.S.A.: Doubleday, 1983. Book. Fine. Hardcover. Signed by Author(s). Book Club (BCE/BOMC). A square solid tight very carefully read copy if at all. This copy has just a hint of soil to the edges of the text block else fine. Basis for the movie. Nice over-all copy of a very scary book. THIS COPY IS IN MY POSSESSION AND NORMALLY SHIPS NEXT DAY. This copy has been inscribed For Vicki -- With best wishes Stephen King 5/14/93. Faux maroon colored leather with gold inlay to the spine and front board. .
New York: Doubleday. Very good + tight bright condition in very good dustjacket. 1983. 1st edition. Hardback, 8vo. 1 inch repaired tear in dj, hint of edgewear otherwise a very nice copy of the First Edition small bookplate . New York: Doubleday, 1983. Very good 1983 hardcover, very good dust jacket, first edition. Slight edgewear to jacket.. First Edition. Hardcover. Very Good/Very Good. 1983-06-06. New. Ships with Tracking Number! INTERNATIONAL WORLDWIDE Shipping available. Buy with confidence, excellent customer service! Signet, 2000-02-01. Mass Market Paperback. Used:Good. New York, New York, U. S. A.: Doubleday. Very Good in Very Good dust jacket. 1983. First Edition. Hardcover. 0385182449 . Mylar protected dustjacket has slight edge wear and price blacked out with marker. Stated first edition. First issue jacket which shows "1982" as the date for Tabitha King's Caretakers on back panel. ; 9.5" tall; 373 pages . 1984-01-04. New. Ships with Tracking Number! INTERNATIONAL WORLDWIDE Shipping available. Buy with confidence, excellent customer service! Berkley. MASS MARKET PAPERBACK. 0451139755 New Condition. . New. Berkley. MASS MARKET PAPERBACK. 0451139755 Like New Condition. . Fine. 2018-03-27. New. Ships with Tracking Number! INTERNATIONAL WORLDWIDE Shipping available. Buy with confidence, excellent customer service! Garden City: Doubleday & Company, Inc, 1983. First Edition. Cloth. Very good/very good. Octavo, 373pp. Black cloth, title printed on spine and signature on cover. Stated first edition on copyright page and "Y38" present on Page 374. Light wear to black cloth at edges. Publishers first state dust jacket, very good plus, with $15.95 price on front flap, light wear to top edge of spine, bright illustrations. An attractive copy. 2017-01-31. New. Ships with Tracking Number! INTERNATIONAL WORLDWIDE Shipping available. Buy with confidence, excellent customer service! 2019-02-26. New. Ships with Tracking Number! INTERNATIONAL WORLDWIDE Shipping available. Buy with confidence, excellent customer service! 2017-05-08. New. Ships with Tracking Number! INTERNATIONAL WORLDWIDE Shipping available. Buy with confidence, excellent customer service! 2018-12-04. New. Ships with Tracking Number! INTERNATIONAL WORLDWIDE Shipping available. Buy with confidence, excellent customer service! 2017-01-31. Good. Ships with Tracking Number! INTERNATIONAL WORLDWIDE Shipping available. May not contain Access Codes or Supplements. May be ex-library. Shipping & Handling by region. Buy with confidence, excellent customer service! Garden City, NY: Doubleday & Company, 1983. First edition, stated. 8vo. Cloth. 373 p. King's 10th novel focuses on the death of a child and cautions us to be careful what we wish for. Minor edgewear to boards. Owner's stamp on ffep. Jacket is edgeworn with a small chip at lower right corner and tiny tears at head and tail of spine. Near fine in very good jacket in mylar cover.. First Edition. Cloth. Very Good/Very Good. 8vo - over 7¾" - 9¾" tall. Doubleday, 1983. (1st edition but second state with 1983 rather than 1982 date for "Caretakers" on DJ back.) Large, heavy book, quality black cloth, very bright gilt facsimile signature at bottom front, very bright gilt lettering on spine, shiny red color inside covers and adjacent end papers, 373 pages plus Epilogue. DJ glossy beneath mylar with color-illustration of grave, man carring child's body and red sky, a snarling cat in foreground front, white back with red and black lettering. DJ has very light wear to front tips, very slight surface wear to spine top edge. Near Fine DJ/Very Fine book.. First Edition. Cloth. Fine/Near Fine.